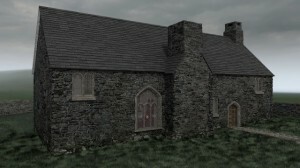 The architecture of fifteenth-century houses of the uchelwyr was an impressive craft. The hall-house was the most common type: a building that was carefully designed and structured of various timber frames to reflect the wealth and status of its owner. Stone was also used, especially in tower-houses and first-floor halls. Research by Peter Smith in his comprehensive volume, Houses of the Welsh Countryside, demonstrated how houses built in various counties shared the same regional characteristics in terms of construction and architectural design. On the whole the internal plan was quite simple and centred around the hall, the main living space which had many distinctive features such as a dais canopy and an oriel. Other rooms were also added during this period, and one notable change was to have a fireplace and a chimney in one of the walls instead of an open fire in the middle of the floor in the hall. : P. Smith, Houses of the Welsh Countryside (1988). See also R. Suggett & G. Stevenson, Cyflwyno Cartrefi Cefn Gwlad Cymru: Introducing Houses of the Welsh Countryside (Aberystwyth & Talybont, 2010).